(off topic!!) Anything new at the Tower of Three? A better cut off point would be to use the apparent magnitude with and without the planets atmospheric extinction effect. I guess you're right. Still, making your own constellations would be cool once ground settlements are implemented. Personally, I always thought constellations were kind of stupid since most of the times they're depicted 90% of the lines are not even connected to stars. The actual shapes are too ambiguous. Yes, this is off topic; no, there's nothing new with it. I usually post new stuff on my website (signature). Does the comet/aurora particle system mean we might see geysers anytime soon? Updated graphics settings menu. A lot of settings! It will be expanded a bit before the release. 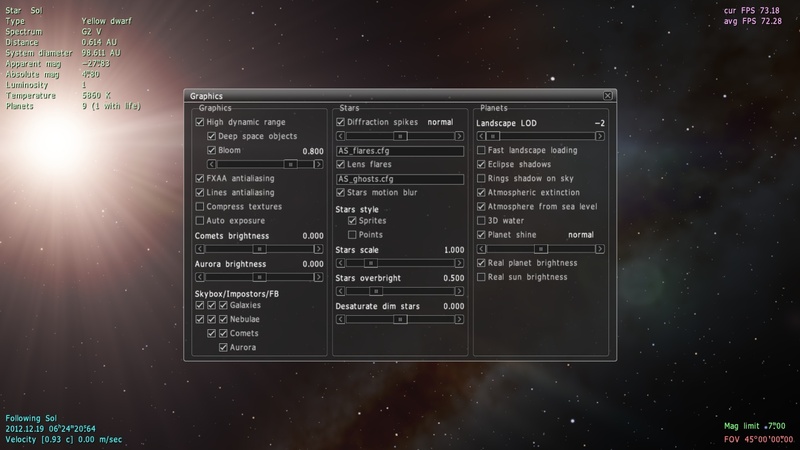 Note the listboxes for choosing the config of the lens flares and ghosts effects. Lens flare and ghost now are "dynamic" - they will rotate and change their brightness depending on the position of the sun on the screen. All effects are adjustable in the lens flare config. Lens flare and ghost now are "dynamic" - they will rotate and change their brightness depending on the position of the sun on the screen. Is solar system generation going to be overhauled in 0.97, or is it going to be saved for later? So the slider adjusts the update frequency of the color, not the intensity of the lighting? Yes. Do you want intensity slider to be added? Yes please, if you can! Space Engineer, I have a question, can you add sounds when you click to a menù?